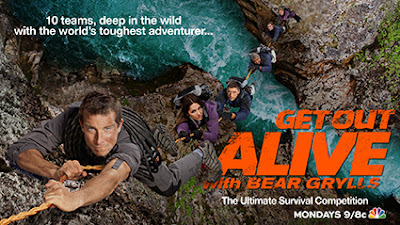 Renowned British explorer and survivalist Bear Grylls is back with the ultimate survival competition, Get Out Alive, airing Mondays 9/8c on NBC! Check out the widget below for more info on the show, and then enter via the Rafflecopter form below - I have one Bear Grylls Survival Bracelet to give to a lucky Yes/No Films reader. 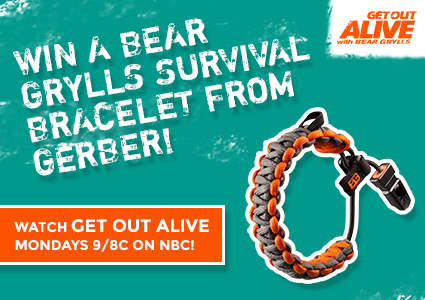 Enter to win an official Bear Grylls Survival Bracelet from Gerber. Taking advantage of Gerber's decades of experience and Bear Grylls' adventure knowledge, this survival bracelet's design provides 12 feet of high-strength paracord to help you work your way out of a difficult situation. Weighing less than an ounce, it has an easy, one-hand size adjustment and an integrated whistle. You can also find the full range of official Bear Grylls Gerber merchandise at Walmart here: http://spark.walmart.com/#inspire/bear-grylls-kit-room. Enter to win via the Rafflecopter form below. The contest ends Sunday, August 11th at 11:59pm EST; winners will be notified August 12th and have 24 hours to respond or an alternate winner will be chosen. Prize will be sent via FedEx or USPS - no P.O. Boxes, please, and U.S./Canada only.